Race Starts at 10.30 on 15th September. The Great North Run is the world's most respected half-marathon and over the last three decades it has further defined the identity and culture of the North East of England. Starting on the Town Moor on the outskirts of Newcastle-upon-Tyne and covering a route of 13.1 miles on its journey to the coast at South Shields, it has become the icon race of its kind, inviting top class athletes to run alongside ordinary people who travel from all over the world to participate in the race. Now in its 33rd outing, the race was first run in June 1981 and was the brainchild of local Olympic medalist and former world record holder Brendan Foster whose company, Nova Inspiring Events are at the forefront of its organisation and delivery with Bupa (the largest private health care provider in the UK) being its main sponsor since the 1990s. Brendan, along with fellow North East Olympian and record-breaker Steve Cram, provide live commentary at this and other athletic events for the BBC. The original race attracted 12,000 participants but this year is set to host around 55,000 runners, who run for fun or for their chosen charity, with many returning year after year. The race starts in different phases, with wheelchair racers at the forefront, followed by the elite athletes and then other runners according to their estimated running times. Fastest first. 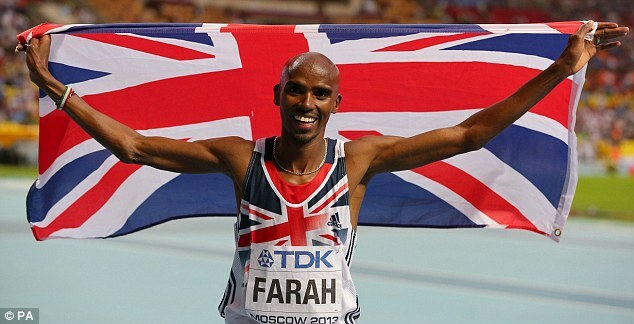 This year, Mo Farah will be the guest of honour as he takes part for the first time. I can still hear Brendan Foster and Steve Cram's excited commentary as they cheered Mo home when he won TWO Olympic Gold Medals in one night at the London Olympics last year. Mo crowned this achievement with a further two Gold Medals at the World Athletics Championship games held in Moscow this summer and broke Steve Cram's 28 year British Record in the 1500 metres event as well. Cram, known locally as the Jarra Arra (Jarrow Arrow in plain English) is said to be delighted with Mo's success as he has 'known him since he was a kid'. The run, which regularly has crowds lining the streets from start to finish is sure to be a huge crowd puller this September as it attracts even more world class athletes from field and track events. Lining up alongside Mo will be several times winner and Olympic Gold Medalist Haile Gebrsalassie and fellow Ethiopian star Kenenisa Bekele. The trio will form an elite line-up of athletes taking part. And they will be joined by fellow African stars Meseret Defar and Tirunesh Dibab, fresh from their triumph in the women's 5000m and 10,000m events in Moscow, making this one of the most exciting races the North East has ever seen. Other well known sports men and women and Paralympic athletes will also compete as the race becomes a celebration of sporting events and a showcase for the crowds. The race attracts many celebrities who run for charity and this year is no exception with TV presenters and all-round dare-devils Helen Skelton and Ben Fogle joining the throng. 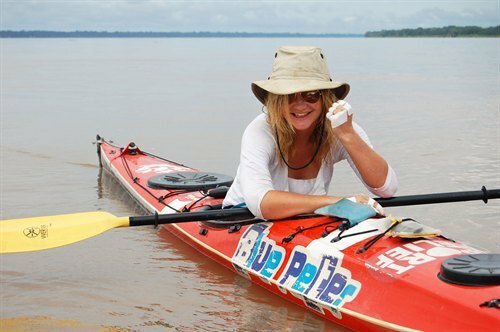 Children's TV presenter Helen recently braved the Antarctic and kayaked along the Amazon while Ben (along with fellow GNR runner James Cracknell and Dr Ed Coates) was part of a British team in the race to the South Pole 2008 and is well known for his outdoor adventure programmes. Actors, radio presenters, newsreaders and comedians are just a few from the world of television and entertainment who will be supporting their favourite good cause. Whilst some contenders are members of their local running clubs, travelling from all over the UK and beyond, the vast majority are just ordinary people who want to challenge themselves or raise money for something close to their heart. And this year my son will be among them. He's running for the first time in aid of Diabetes UK – so good luck Philip. Entry for this year has already closed as the race is always massively over-subscribed, however, some charities block book their entries in the anticipation that someone will take up a place and fund-raise for them, so it may not be too late yet - see here. I asked Philip for his experience of applying to join the GNR. He told me that it had cost £45 to enter the race giving his estimated time of completing the course. He was then entered into a ballot and the fee was only deducted from his account once he had gained a place. The course is said to be quite hilly and can be gruelling but the camaraderie is often what gets people round. This year 'bands on the run' will help to keeps the momentum going for contenders as they provide music at certain points along the way. Staging posts for drinks and walk-in showers are available along the route to help keep you cool, along with medical assistance should it be necessary. 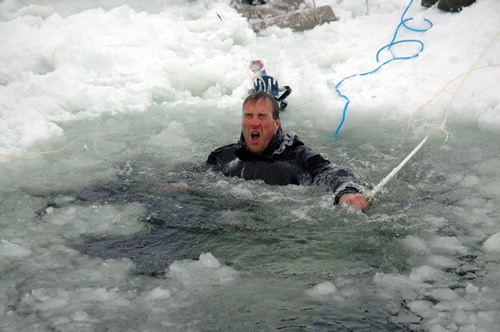 Sadly, several people have died over the years and the event organisers are always looking to reduce any risks. The race was originally run in the month of June but was changed to September as this is often cooler. The race ends on The Leas at South Shields with the final descent at Redwell Bank near Marsden Bay. Look out for The Marsden Inn if you're running as this is at the top of the bank before the final stretch on the coast road towards the finishing line near Gypsies Green Stadium – the home of the South Shields Harriers. 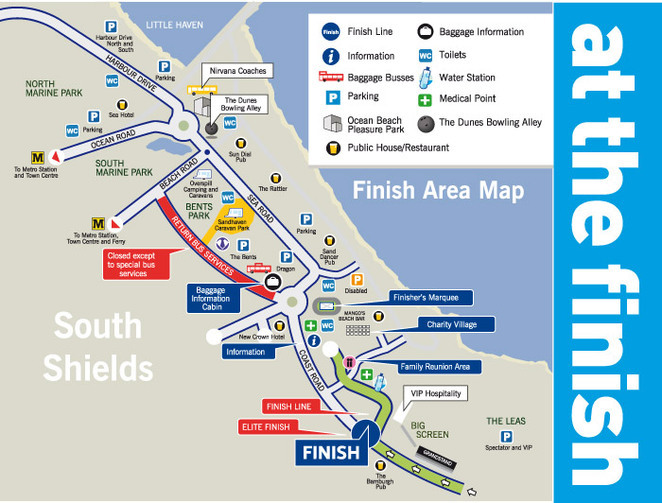 Organising the race is like a military operation, with colour coded start points on the Town Moor and baggage buses at the ready to transport personal belongings to the finish point where a line of buses are also laid on to ferry runners back to Newcastle. Once over the iconic Tyne Bridge, the route affects mainly the south of the River Tyne in terms of road closures, with the A184 Felling bypass, A194 Leam Lane, A1300 John Reid Road and the A183 Coast Road in South Shields being shut down in order for the race to take place. They are open again in the late afternoon. 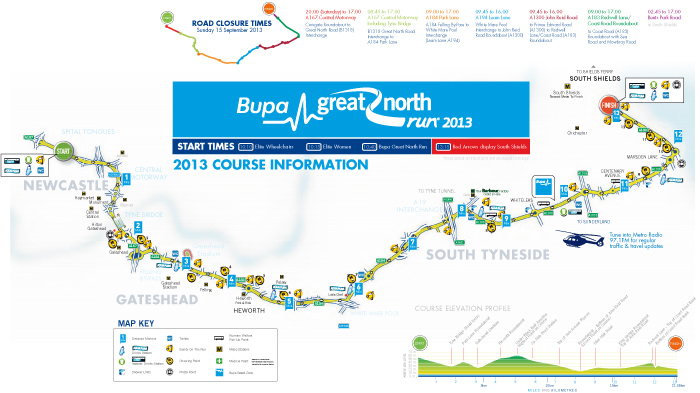 Alternative vehicle routes to the finish point during the race are from North Tyneside via the Tyne Tunnel and from Sunderland to the south of the GNR route. The Tyne & Wear Metro trains also travel to and from Newcastle and terminate in South Shields town centre. If, however, a half-marathon is not for you, a weekend of other events including Junior and mini races and a 5k run is planned to take place alongside the GNR on 14th September, giving people of all fitness levels the chance to join in. 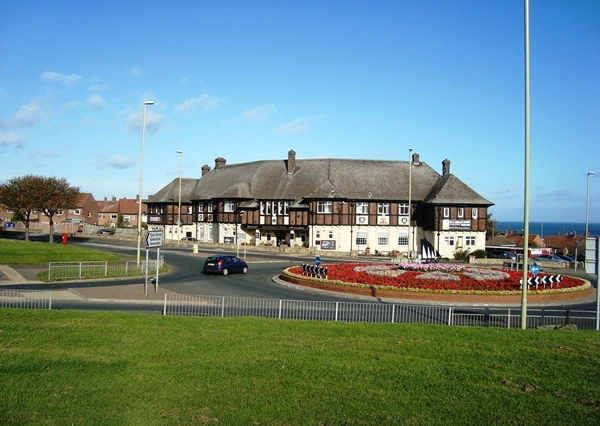 When you get to the end, there are plenty of pubs and restaurants on South Shields sea front to help you relax and recuperate. I'm no expert on replenishing fluid levels after a race, but I know that many establishments make a roaring trade on GNR day, especially with the spectators. So wind-down, soak up the atmosphere and take it easy.